DIFFERENT DENSITIES of air cause differing refractions of light. This scintillation is what causes shimmering images of hot landscapes on a sunny day. Capturing such images is challenging, but NASA has perfected an advanced method of what’s called Schlieren photography to produce stunning photos of two jets interacting supersonically at 30,000 ft. above California. This Schlieren photography shows two jet aircrafts’ disruption of the air, the effects enhanced through colorization. Image from NASA. A Pair of Talons and a Beechcraft. 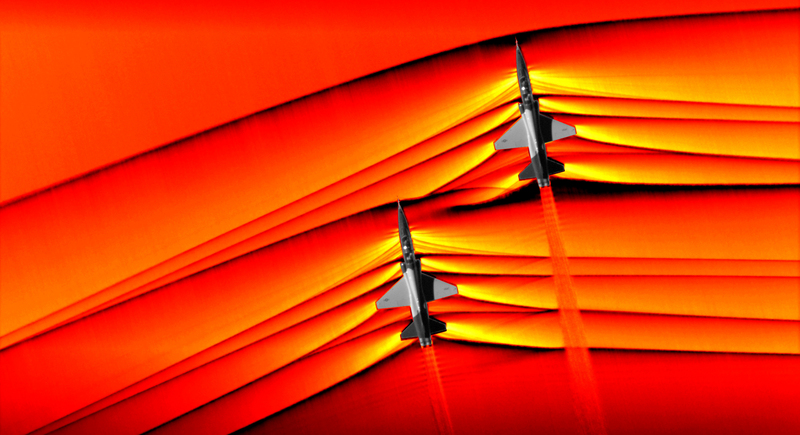 In “NASA Captures First Air-to-Air Images of Supersonic Shockwave Interaction in Flight,” March 5, 2019, the agency reports that this and other images were captured in the fourth phase of AirBOS, Air-to-Air Background Oriented Schlieren flights. A Beechcraft B-200 King Air carrying the advanced imaging equipment flew over the pair of Northrup T-38 Talon jets above NASA’s Armstrong Flight Research Center in Edwards, California. The two Talons, traveling supersonically, were approximately 30 ft. from each other, the trailing aircraft about 10 ft. below the leading T-38. The Northrup T-38 Talon is a two-seat, twin-jet, supersonic trainer introduced in 1961. Some 500 are still in service with the U.S. military; NASA has 32 Talons retired from the USAF. Studies of such aircraft interactions as well as exhaust plumes are topics of interest to researchers. 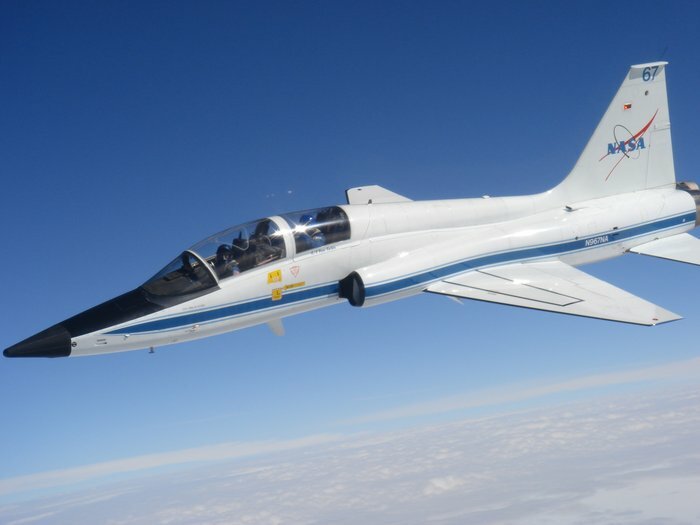 Another AirBOS goal is supporting a Low-Boom Flight Demonstration using NASA’s X-59 QueSST. This Quiet SuperSonic Technology X-plane is designed to replace traditional sonic booms with only a quiet rumble in supersonic flight. 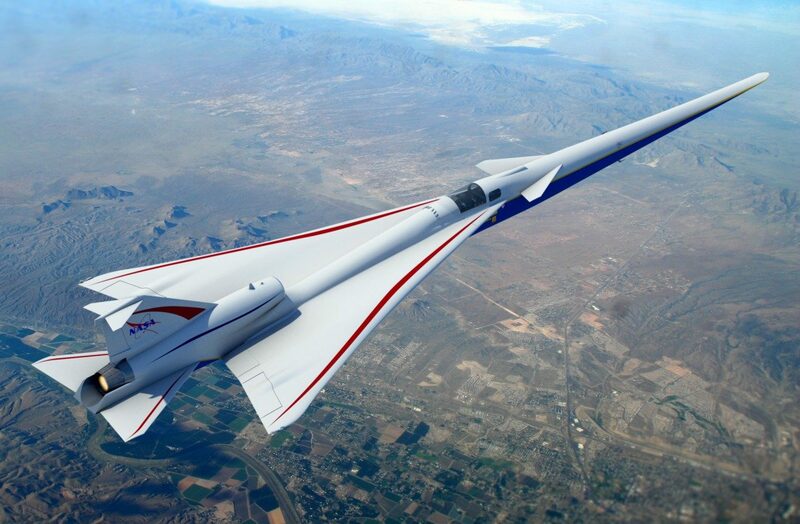 It’s hoped that advanced techniques will permit lifting of current restrictions on supersonic flight over land. An artist’s rendering of the Lockheed Martin X-59 QueSST. Image from Lockheed Martin. Schlieren Photography. The key to capturing these supersonic shockwaves dates from the work of French physicist Léon Foucault, 1819–1869, and German physicist August Toepler, 1836–1912. In 1858, Foucault devised the knife-edge test of measuring optical mirrors to a precision of millionths of an inch. In 1864, Toepler applied Foucault’s knife-edge idea to photograph fluid flow and shockwaves. 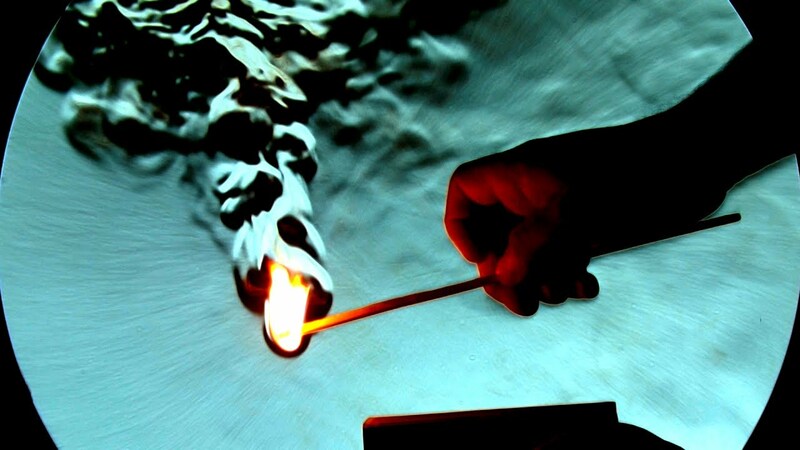 Toepler named this technique Schlieren photography, after the German word Schliere,streak. The method is widely used in aerodynamic studies of flow around objects. To learn more about the technique, see Veritasium’s Schlieren Imaging on YouTube. Wow! What else can I write? This entry was posted on March 26, 2019 by simanaitissays in Sci-Tech and tagged "NASA Captures First Air-to-Air Images of Shockwave Interaction in Flight" NASA, "NASA Captures Two Jets' Supersnic Shockwaves by Applying New Tech to an Old Idea" Joseph Trevithick The Drive, AirBOS = Air-to-Air Background Oriented Schlieren, August Toepler 19th-century German physicist Schlieren photography, Beechcraft B-200 King Air, Leon Foucault 19th-century French physicist knife-edge test, Lockheed-Martin X-59: NASA QueSST: sonic boom vs rumble, NASA's J.H. Heineck Schlieren photography, Northrup T-38 Talon jet trainer, Schlieren photography, Veritasium's Schlieren YouTube.